Carrie is about to make her choice. She will leave her family and Amish community behind and follow her beau into the world. Tragedy strikes, and a different choice is made for her. As Carrie struggles, she is faced with yet another difficult decision. Again, Carrie makes her choice and marries a man she does not love. Circumstance after circumstance, choice after choice, Carrie wades through seemingly endless grief to find her way to forgiveness and even love. Like many recent Amish-based books I’ve read, The Choice had quite a bit of “English” in it. Although I’m coming to expect and even dread that, The Choice was a fairly believable story (except for Steelhead and Emma! Huh?!) and a good reminder of the effect our decisions, good and bad, can make on our life. You can read the first chapter HERE and see what other bloggers had to say about Suzanne’s latest book HERE. 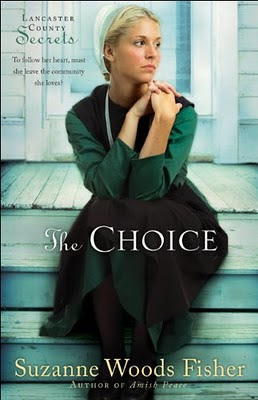 Thanks to litFUSE for sending me a review copy and allowing me to participate in the blog tour for The Choice! Thanks for taking time to read my review. I enjoyed The Choice, and my reference to the "English" was more for the regular readers of my book reviews. It basically referred to my dislike of contemporary settings - and characters. While it is true that the saved Christian today (and Amish) lives among the world and can't hide from it, I am uncomfortable when worldly subjects are discussed. We all have to deal with worldliness, from work to television to music, but I don't want to have to feel edginess in my Christian books. Perhaps it's naive of me to think a Christian book today can avoid going into depth on worldly subjects and still be a good story. While I didn't think The Choice was "full" of worldliness at all, I do try to give my fellow Christian readers a heads up in case they do decide to purchase a book that I've reviewed! I probably wouldn't even care as much if it was just ME reading the book, but since I have to share it...I want to be honest. I know that even "prairie" settings mention saloons and lust, but I think I prefer settings prior to WWII when ipods and twitter were non existent! An Amish setting is hard to gauge just by a book cover or the back cover's teaser. Usually not until you've passed a few chapters do you realize the time period may be in 2010. I still look forward to seeing what The Waiting holds!